1. 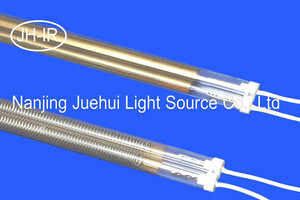 More match IR spectrums: IR heating lamps from Nanjing Juehui Elec lighting Tech Co., Ltd cover the whole IR range. Infrared short wave (SW), infrared fast response medium wave(FMW), infrared medium wave (MW), infrared carbon medium wave (CMW). By choosing the correct spectrum for you production can give you shorter heating time, higher production rate and more energy saving. 2. Higher thermal density output: High quality material and polished fabrication process give the power of a single IR quartz heater be ranged from couples of ten watts to couples of thousand watts. You have sufficient choose to meet any requirement. S.N. LAMP TYPE HEATED COL. TEMP.